Serge Devadder (Brussels, 1966) is a self-taught musician with a strong interest in electronic textures and loops. Heavily influenced by ambient electronica, atmospheric film scores and classical impressionist minimalism, Serge Devadder has developed his own style of ambient sonic paintings but the basis has also connections with Berlin School. Following some early solo and collaborative tape project and concerts in the 80-90s, Serge Devadder joined Vidna Obmana in 1999 for the CD The Shape Of Solitude on the Swedish Multimood label. 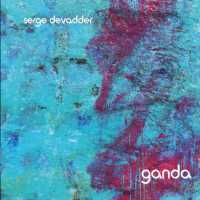 Since then, Serge occasionally released solo tracks on various sampler CDs in Europe, the USA and Asia. 2014 marks the release of his full-length solo-album Cambrian andf it was this CD that I really liked, it has one of the nicest atmospheres ever created on CD. And with this in mind I heard the recordings of his performance during this years Cosmic night on the 19th of March! And I instantly fell in love with it. This is music that captures the mind and soul.